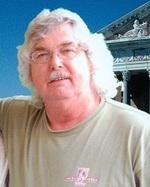 Obituary for Christopher Noel Plummer | Crandall Funeral Home Inc.
Christopher Noel Plummer, 60, died November 15, 2011 in Rocksprings, Wyoming. Christopher was born on December 19, 1950 in Bedford, Pennsylvania to Ralph and Mildred Plummer. Christopher worked for Tata Chemical in Green River, Wyoming. He enjoyed collecting cars, and watching races. He was also the former National President of the Lincoln Highway Historical Preservation for old Hwy 30. Christopher is survived by his loving wife, Carol Graeber Plummer; son Aaron (Kristen) Plummer of Kennewick, Washington; step-sons Bill (Dawn) Morgan of Overland Park, Kansas, John (Anya) Morgan of Littleton, Colorado, Jeff (Kristin) Morgan of Parker, Colorado; step-daughters Cristel Morgan of Glenrock, Wyoming, and Jennifer Morgan of Ontario, California; 11 grandchildren and a brother Mark Plummer. A memorial service to honor his life will be held on Monday, November 28th at 11:00am at the Bridger Valley Baptist Church. A luncheon will be served for family and friends following services.